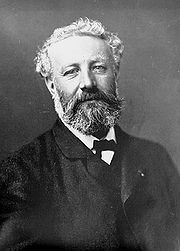 As we lay down our heads, we might send grateful birthday greetings to the extraordinary Jules Verne, imaginative writer non pareil (c.f., e.g., here); he was born in Nantes on this date in 1828. Best known for his novels A Journey to the Center of the Earth (1864), From the Earth to the Moon (1865), Twenty Thousand Leagues Under the Sea (1869–1870), Around the World in Eighty Days (1873) and The Mysterious Island (1875), Verne is the second most translated (individual) author of all time, behind Agatha Christie. He is considered, with H.G. Wells, the founder of science fiction. Verne was startlingly prescient: Paris in the 20th Century, for example, describes air conditioning, automobiles, the Internet, television, even electricity, and other modern conveniences very similar to their real world counterparts, developed years– in many cases, decades– later. From the Earth to the Moon, apart from using a space gun instead of a rocket, is uncannily similar to the real Apollo Program: three astronauts are launched from the Florida peninsula– from “Tampa Town” (only 130 miles from NASA’s Cape Canaveral)– and recovered through a splash landing. And in other works, he predicted helicopters, submarines, projectors, jukeboxes, and the existence of underwater hydrothermal vents that were not invented/discovered until long after he wrote about them.